Wales is an 8,000 square mile landmass jutting west from England into the Irish Sea. The southern region of Wales is home to the capital, Cardiff, and the northern region has the Brecon Beacons National Park in Breconshire. Wales is known for its large historic castles, many built by Edward I in the 13th century to demonstrate the supremacy of the English crown over the Welsh. 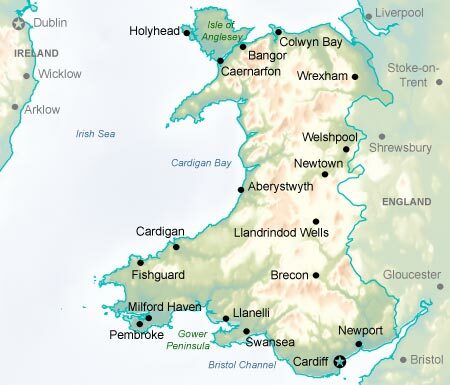 Although technically a British principality of nearly 3 million people, governed from London, Wales has been divided into two distinct cultures. One embraces the English language while the other and comprising one quarter of the population, the Welsh, carry their own unique language. The Welsh culture has endured over the years, most notably with the 1997 passage of a 'home rule' referendum. The new Welsh assembly began meeting in Cardiff in 1999.